Filing for divorce is a stressful process, and it is not always the case that both spouses want the divorce to proceed. A party to a divorce may have many reasons to refuse to sign the divorce papers, including anger or frustration. But you can still obtain a divorce in Georgia even if your spouse refuses to sign the divorce papers. To begin the divorce process in Georgia, one party files a complaint in Superior Court -- generally in the county where the other spouse lives. The complaint states a reason for the divorce and information regarding the marital assets and current living situations of the spouses and any children. At the time you file the complaint, the court may set a time for the divorce hearing. Once you file the complaint, provide your spouse with notice of the divorce by serving him with a copy. Service can be accomplished in several ways including hiring an authorized process server or paying the sheriff to serve the complaint. If your spouse cannot be found for personal service, you may serve him by publication, which involves placing an ad in a newspaper giving notification of the divorce case. After your spouse receives notice of the divorce case, he has an opportunity to file an answer that responds to all of the issues raised in the complaint. Any points not addressed in the answer are accepted as true by the court. In Georgia, if your spouse does not respond to the complaint within 30 days of receiving notice, a default divorce may result. In a default, or unanswered, divorce, the judge usually grants the divorce in the filing spouse's favor, approving some or all of the requests made in the complaint. A judge may approve a motion requesting an extension of time to file an answer if your spouse requests it. If you and your spouse cannot agree regarding the terms of your divorce, it is necessary for you to attend a final hearing so the judge can make decisions about the contested issues. A Georgia judge always makes the final determination in a divorce regarding parenting time and child custody, even if the case is heard by a jury. The hearing is a final opportunity for your spouse to appear and respond to your requests for relief. During the hearing, you may be asked to testify regarding the relief you requested in the complaint. If your spouse does not appear at the hearing, the court will likely grant your request for a divorce without your spouse’s agreement, and you may receive all relief requested in your complaint. 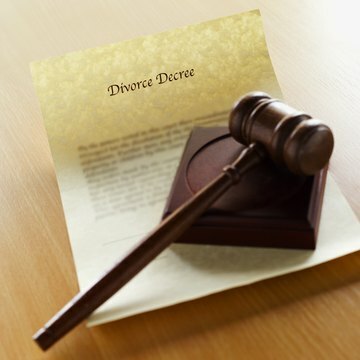 Your divorce is not final until the judge enters a final order, granting the divorce. In Georgia, 31 days after your complaint is filed is the earliest possible date on which the court can enter a final order of divorce in an unanswered, or otherwise uncontested, divorce. However, consult your local courthouse to confirm the time period, and any other deadlines, followed by your court. Are You Required to Sign Your Divorce Papers in Georgia? After you file a divorce petition in Broward County, Florida, you must provide your spouse with a copy of the filed petition, referred to as service of process. If you do not properly serve your spouse with a copy of the divorce papers using the sheriff’s office or a private process server, and your spouse has not waived service, the judge can deny the divorce and dismiss your case. Therefore, following Florida's rules for service is very important. In Ohio, a couple can terminate their marriage by obtaining a dissolution of marriage or a divorce. In some cases, annulment is also an option. With a dissolution of marriage, fault grounds are not an issue; however, a dissolution petition is not filed with the court until the parties have reached an agreement on all issues that must be addressed in a divorce matter, including division of property, custody and maintenance. Both parties must appear in court. If you cannot locate your spouse, you must file for a divorce. Although the process takes some time, it is relatively simple to obtain a divorce. If you have children or significant assets with your spouse, consider hiring a legal and/or financial professional to guide you through the divorce process. You may also consider using an online legal preparation website to prepare and file your divorce forms. Though attorneys can be helpful when it's time to end your marriage, you can file your own divorce papers in Washington State. Completing the process yourself can help you save money and time, particularly if your divorce is not complex. You can obtain many of the necessary forms from your local court, or you can use an online legal document service to prepare and file your paperwork. Can You Refuse to Give Your Spouse a Divorce in Georgia?